Four years ago, the Lazord Academy for Civic Leadership was created as part of the John D. Gerhart Center for Philanthropy and Civic Engagement at the American University in Cairo. The main purpose of the Academy was to provide potential civic leaders in all fields with the necessary skills and tools for leading change across many sectors. Some of the civic leaders who participate in our programs work or are interested in the economic development field, human rights, women’s issues, street children, and other social affairs. The Academy has evolved throughout the years as new tracks are added, such as the Civic Professionals program for Lazord Fellows and employees from partner nonprofit organizations, and also as existing tracks get solidified, such as the track of Advocates for Civic Engagement for undergraduate students. All these programs are united with the vision of graduating a generation of civically responsible and skilled leaders that play an active and engaged role across various sectors. 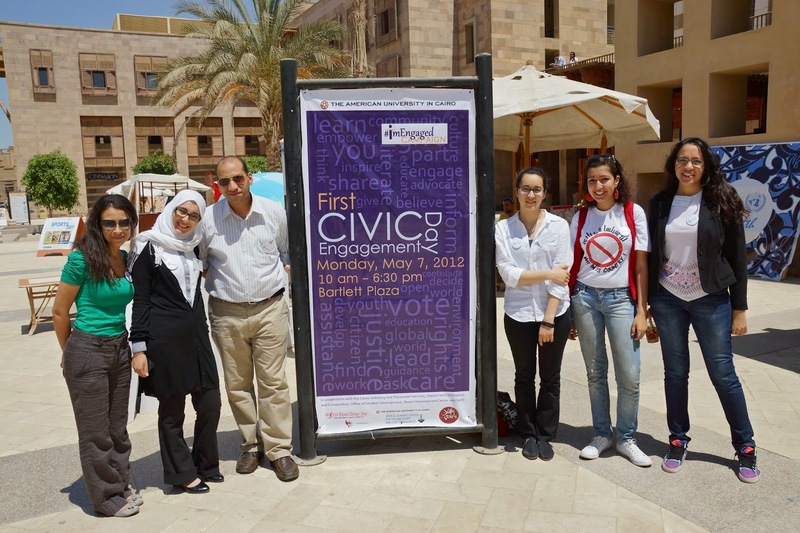 Lazord’s mission is to empower select AUC students and young civil society leaders by offering them guided opportunities to expand their skills in ethical leadership, civic engagement, and strategic philanthropy. The Academy aims to provide its civic leaders with exposure to the inner workings of civil society through practical experience, workshops, and mentorship. Accordingly, the participants’ academic excellence and personal growth are facilitated in a structured environment that helps them build the bridge between theory and practice. The Academy has been engaged in continuous development this year, with an emphasis on its methodology. When planning for the 2013-2014 academic year, the team gathered to unify the methodology across all tracks. This process was composed of three main stages: the development of a curriculum map, creation of a methodology based on ecological systems theory, and development of the phases and topics for each ecological system. During the first stage, program coordinators developed a curriculum map based on the values and learning outcomes of the Academy. The values of the Academy are proactive citizenship, respect for diversity, participatory practices, reciprocity of learning and service, integrity in learning, knowledge sharing, critical reflection, self-awareness, innovation, and creative problem solving. The desired learning outcomes are for participants to gain exposure to the inner workings of civil society through extensive exposure, practical experience, and mentorship; develop civic leadership skills; empower the community by acting as a catalyst for strategic philanthropy and capacity building; gain professional competencies through numerous opportunities at the professional and self-development levels; and build a professional network and portfolio. The step of creating a curriculum map led to the creation of competencies, inspired by and derived from the community psychology practice competencies (2012), as well as the Gerhart Center’s own standards, and local Arab expertise engaged in the last years of the program. The curriculum map inspired the topics for the curriculum and helped visualize the different phases that students would move through. The phases included Exploration, Discovery/Rationalize, Plan, and Act, all of these derivable from the community psychology practice competencies. In stage two, ecological systems surrounding the participants were developed. These systems were inspired by Bronfenbrenner (1977) and Prilleltensky, Nelson and Peirson (2001), who suggest that a person is a part of a community and society – to understand or change the person or the community, one needs to look at all the ecological systems and levels that the community is constructed of: individual, micro, meso, exo, and macro-system levels. Accordingly, for each track, an adaptation of the systems theory was formulated for each training program. For example, the systems for one track were Me, My Cause, and My Community. For the other track, the systems were Me, My Community, Egypt, and the World. Hence the curriculum is constructed of ecological systems surrounding the individual; the core being the discovery of personal potentials surrounded by a micro system, which is nested within community-related systems and workforce practices. Each system division includes sessions that directly affect these ecological systems. For example, the Lazord Civic Professional, a track for young leaders working in non-profit organizations, is composed of Me, My Work, the Cause, and Community/Egypt. Following the creation of ecological models for both training programs, stage three involved arranging topics in each ecological system in a way to match the four phases – namely, the progression of Explore, Discover/Rationalize, Plan, and Act, in each of the systems. Each topic aligned itself to a previous training needs assessment and previous training topics that received high satisfaction rates; topics were also selected based on their alignment with the competencies that the participants should gain. The core of the training program is the skill of critical thinking; accordingly, critical thinking was addressed in all systems. After the plan and curriculum were put together, the different tracks were implemented throughout the year. Some difficulties in implementation included the current instability in political structure of Egypt, and the commitment of the trainers and speakers. In addition, it was sometimes difficult for the coordinators of the programs to maintain the new structure, and sometimes challenging for participants to understand the program’s progression. Evaluation came after implementation. Formative and summative evaluations of the Academy were conducted in three ways: session evaluations, collective evaluations, and pre/post competencies self-evaluations. Session evaluations were gathered after each session, while collective evaluations were conducted both midway through and at the end of the program. These evaluations mainly evaluated the trainer, the logistics, and the program as a whole. The pre/post competencies self-evaluations were conducted before and after the program by the participants. These evaluations may have been the most important, because they gave us an idea of the gaps and further needs of the programs, while emphasizing the development of the participants. Although the evaluations provided us with data about the progress of the program and the development of the participants, they have clearly highlighted room for improving the methodology, the curriculum, and most of all the evaluation process for the coming year. Through self-evaluation, the participants indicated progress on some of their competencies while some other competencies stayed the same or deteriorated. Such results indicate a deficiency in our evaluation system. Accordingly, for the next cohort we are compiling all the evaluations to develop the program further, in addition to planning new evaluation methods that will better assess the program’s structure and content. In planning the Academy’s future for the upcoming year, one of the major lessons learned throughout the process is that we need to continue building on the program that we have rather than simply changing our methodology. We concluded that by sticking to our methodology and only using the evaluations of the participants and stakeholders’ views to improve it, we will be able to strengthen our methodology and impact in the long run. Competencies for Community Psychology Practice. (2012). Draft paper. Society for Community Research And Action, Council on Education Programs and Community Psychology Practice Council, Task Group on Defining Practice Competencies. Prilleltensky, I., Nelson, G., & Peirson, L. (2001). Promoting family wellness and preventing child maltreatment: Fundamentals for thinking and action. Toronto: University of Toronto Press.